Wing span: 1 1/4 - 1 3/4 inches (3.2 - 4.5 cm). Identification: Includes three dissimilar subspecies; all have yellow felt inside the male's forewing stigma. Leonard's Skipper (H. l. leonardus): Upperside is red-orange with wide black borders. Underside of hindwing is brick red with a band of white, cream, or yellow spots. Pawnee Skipper (H. l. pawnee): Upperside is red-orange with reduced black markings. Underside of hindwing is yellow-orange and may have a band of faint spots. Individuals intermediate between these 2 subspecies are found in Wisconsin and Minnesota. 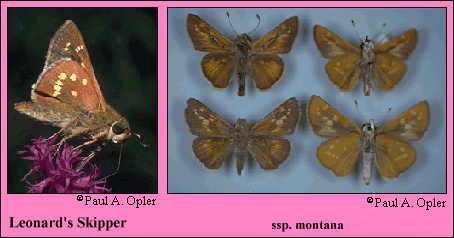 Pawnee Montane Skipper (H. l. montana): Upperside is brownish red with distinct yellowish spots near the outer margins. Underside is brown with cream spots. Life history: Males perch or patrol near nectar plants to find receptive females. Eggs are scattered on or near the host plants. Caterpillars feed on leaves and live in shelters of tied leaves. First-stage caterpillars hibernate. Flight: One brood from August-October. Caterpillar hosts: Various perennial grasses including little bluestem (Andropogon scoparius), blue grama (Bouteloua gracilis), and bent grass (Agrostis). Adult food: Flower nectar, especially from blazing star (Liatris punctata), but also thistles, asters, teasel, and others. Habitat: Open grassy areas including native prairies, fields, barrens, and meadows. Range: The Pawnee Skipper occurs from western Montana and southeastern Saskatchewan east to Minnesota, south to Central Colorado and Kansas. Leonard's Skipper ranges from Nova Scotia and Maine west through southern Ontario and the Great Lakes region to Minnesota, south to North Carolina, Louisiana, and Missouri. The Pawnee Montane Skipper occurs only in the South Platte River drainage of Colorado. Conservation: The Pawnee Montane Skipper is listed as a Threatened species because of its small numbers and small range (25 x 5 miles). This subspecies has The Nature Conservancy rank: T1 - Critically imperiled globally because of extreme rarity (5 or fewer occurrences, or very few remaining individuals), or because of some factor of its biology making it especially vulnerable to extinction. (Critically endangered throughout its range). The other subspecies have The Nature Conservancy rank: T4 - Apparently secure globally, though it might be quite rare in parts of its range, especially at the periphery. Management needs: For the Pawnee Montane Skipper, periodic fire may be necessary to maintain the open nature of the habitat. Continue to monitor populations. Washington, D. C. 636 pages. Opler, P. A. and G. O. Krizek. 1984. Butterflies east of the Great Plains. Johns Hopkins University Press, Baltimore. 294 pages, 54 color plates. Boston, Mass. 370 pages, 23 color plates.